"Arizona, I'm looking at you" to pass the Equal Rights Amendment, says Rep. Pamela Powers Hannley on the occasion of Nevada's passage of the ERA. “Arizona, I’m looking at you” to pass the Equal Rights Amendment, says Rep. Pamela Powers Hannley on the occasion of Nevada’s passage of the ERA. Ratification of the Equal Rights Amendment (ERA) was proposed in eight states in 2017: Nevada, Arizona, Utah, Missouri, Virginia, Florida, North Carolina and Illinois. On March 22, 2017– the 45th anniversary of Congress starting the ratification process in 1972– Nevada became the 36th state in the US to ratify the ERA. To make the ERA the next amendment to the US Constitution, we need two more states to ratify it and the Congress to extend the deadline, which they have done before. Arizona women deserve equality and equal pay for equal work. We won’t get that until we pass the Equal Rights Amendment because the ERA puts teeth in the Lily Ledbetter Fair Pay Act. 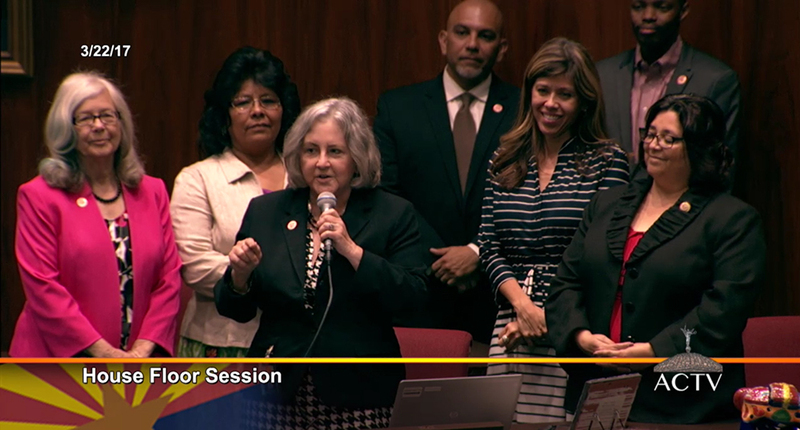 The ERA has been proposed at least five times in the Arizona Legislature– first in 1972 by then Arizona Senate President Chief Justice Sandra Day O’Connor; three times (two ratification proposals, one deadline extension) by Rep. Victoria Steele; and this year jointly in the Senate and the House by Senator Martin Quezada and me. In Arizona and Utah, the 2017 bills were never heard. My bill HCR2012 was assigned to the Judiciary Committee but never put on an agenda. Quezada’ ERA mirror bill was assigned to the Government Committee but never heard by the chair. Along with other state legislators across the country, I will propose ratification of the ERA every year until it becomes law. I hope Arizona remembers its Progressive roots and helps add to finally add the Equal Rights Amendment to the US Constitution. In 1982, in the case of NOW V. Idaho, the U.S. Supreme Court ruled that the ERA was dead. If the ERA is to be adopted, it needs to start over. Keep on Keeping on, Pamela. This needs to happen. Who do we need to lobby? Everyone who wants Arizona to pass the ERA, should send email(s) to their Legislators– Republicans and Democrats — and encourage them to vote for ratification the next time the Equal Rights Amendment is proposed. Also, at the Congressional level, we need federal representatives to vote for extension of the ratification deadline. For example, Martha McSally says she is for women’s rights. She could be the ERA proponent in Congress. Representative Pamela Powers Hannely … You rock! Once we get a blue state senate we will push this through. Don’t understand why equality is so frightening?….. The capitalists would lose a lot of money if they had to pay women equally. Latinas make 55 cents on the dollar compared to a white man.